In order to have a better understanding of Windows Phone, I’m migrating from my old and tiny iPhone 4S (3.5″ display) to the huge Lumia 1520 (6″ display), (Thanks MS for the gift). I’m also switching carriers, from Verizon to AT&T. 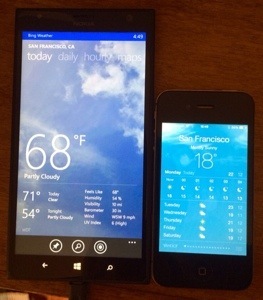 My very first impression is that Windows Phone is different. I’m not saying it is worse or better than iOS, it is just different. It is an smartphone , so it has Apps, a Store, Maps, Messages, and more… but with a different interface. If you are coming from iOS or Android it might take a while to get used to it. As an example, the “Start” screen is the start screen (sic)… and it has “live tiles“. 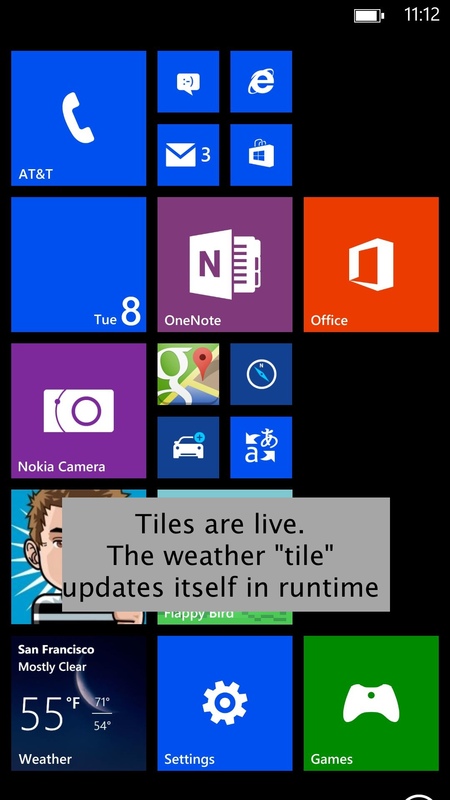 A tile is like an bookmark (or symbolic link) to an app but “live”: it can change its “icon” in runtime. You can also change the size of the tiles, and re-order them. From the “start” screen you can transition to the “apps” screen with a swipe to the left. 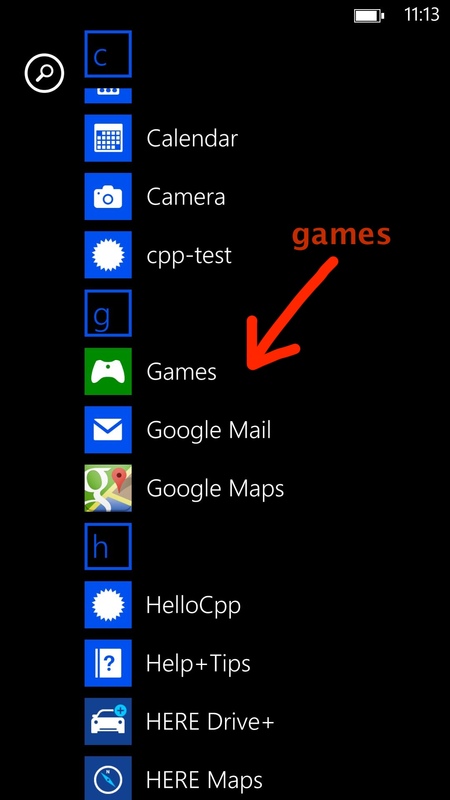 It contains a alphabetically-sorted list ofall your installed apps… as long as the apps are not games. Games are stored in another container called “games” 🙂 So, you won’t find any games in the “apps” screen… you can’t even search for installed games from the “apps” screen. Once you are in the Games “folder”, you will notice that there are two game categories: “xbox” and “other”. 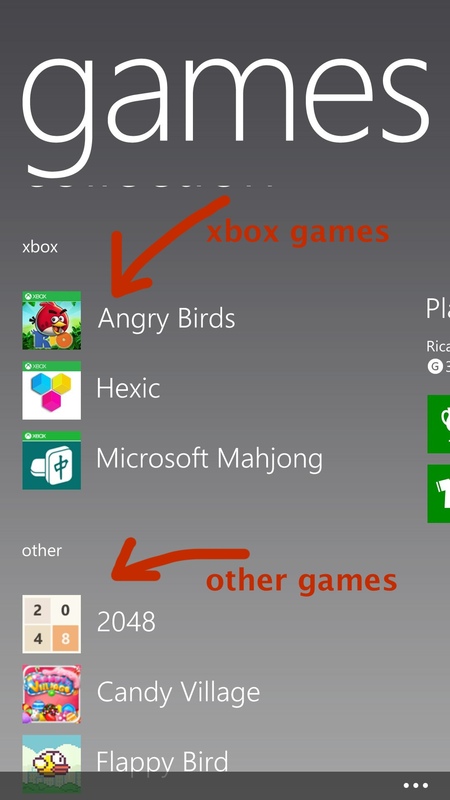 For example, Angry Birds is in the xbox category, while Flappy Bird is in the “other”. And all the “xbox” games have a green xbox legend at the top of the icon. But I still don’t understand why Microsoft is making this distinction between “xbox” and “other” games. I don’t know what are the requisites to be an xbox game, although I assume that your game has to use the xbox services. But it is like if Apple were making a distinction between games that use GameCenter and games that don’t. That was just my first impression of the phone. I’ll keep playing with it and I’ll post new discoveries in future posts.